An incomplete copper-alloy unidentified object of uncertain date. It is sub-rectangular in form with rounded outer edges decorated with transverse grooves. Through the centre is a square shaft. At its base is a pair of undecorated slightly expanding curvilinear bars 2.45mm in thickness. 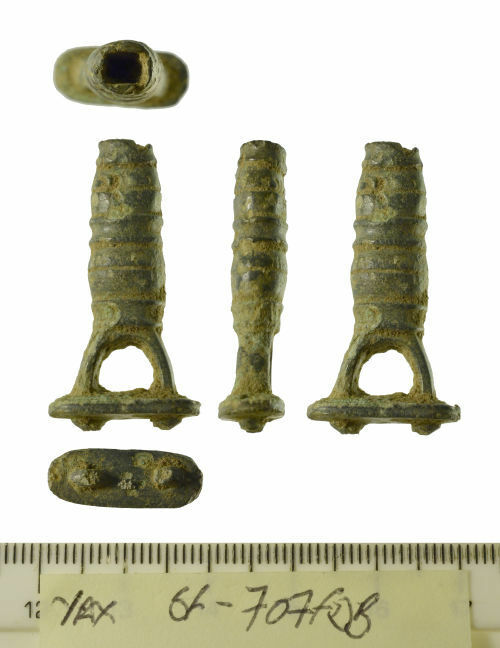 These connect to a flat oval plate 17.96mm in length, 8.51mm in width, 3.14mm in thickness via a pair of separately cast circular copper-alloy rivets. This object measures 34.36mm in length, 11.60mm in width, 7.45mm in thickness, 8.76g in weight.